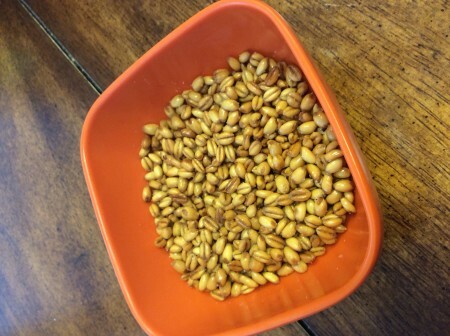 A few months ago, I contributed for the soft white wheat berries on a whim. I had never ground my own wheat and didn’t even own a device that would do it. I read that you could eat it like oatmeal in the morning or in tabbouleh salad so I was convinced that I would find fabulous things to do with them. Honestly, they have sat for quite a while. However, this morning I woke up inspired! My family LOVES cereal and I have tried to get them to add other breakfast items into their repertoire. Mostly, I’m quite unsuccessful. They enjoy the ease of eating a cold bowl of cereal in the morning – even granola is a failure. 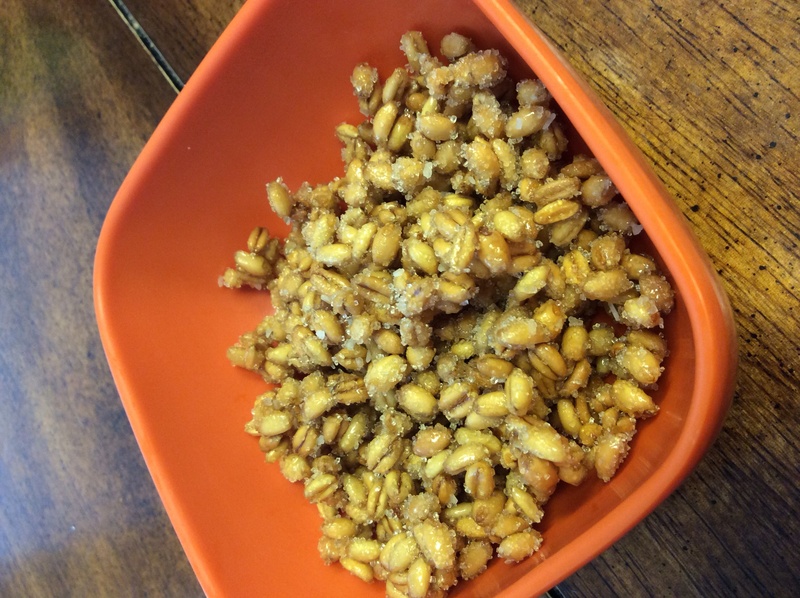 One of the cereals that we often buy is the puffed wheat that has a honey coating on it. I thought that I could do something similar with the wheat berries. So I whipped up a small, experimental batch. Once the cooled, I sampled a handful and they were delicious! Unfortunately, when I added milk the texture changed and I didn’t care for them as much. All is not lost because they make a wonderful whole-grain snack. Of course, because of my successful sweet wheat berry snack, I needed to also make a savory snack. The savory ones are so good (almost like popcorn or something) and versatile and they would make an excellent salad topper also. Both versions are really good and easy. These snacks pass the family test which makes me really happy because wheat berries are loaded with good nutrition! I’ll just need to go back to the drawing board on the cereal. Put the oil in a skillet on medium heat. Add the wheat berries and cook them for several minutes until they are tan and toasty smelling. Spread them out on a pan and sprinkle them with salt. You could also add other seasonings like cayenne, taco, chili seasoning, curry, cumin, etc. Spread the wheat berries out in a single layer on a parchment paper lined baking sheet. Bake them, stirring occasionally, until they are tan and toasty smelling. Meanwhile, combine the sugar and salt together in a small bowl. Stir the honey, water and olive oil together in a sauce pan. Bring to a boil. Reduce heat to med-high. Pour the toasted wheat berries into the sauce pan. Stirring occasionally, cook them until the wheat berries have absorbed all of the liquid. Pour the wheat berries back onto the parchment lined baking sheet and sprinkle with the sugar mixture. Spread them back out into a single layer. Once they have cooled, you can enjoy them! Sorry for the super long delay in responding! I used raw wheat berries for these particular recipes. Thanks for the recipes! 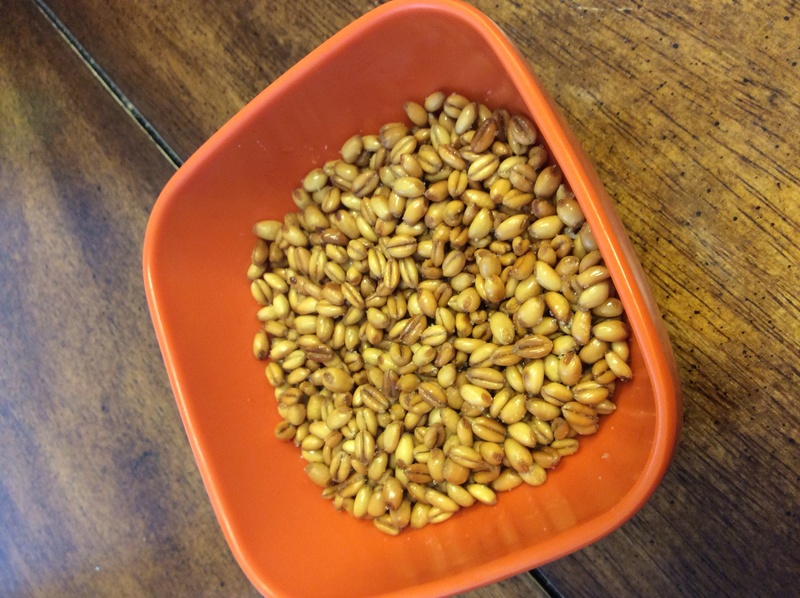 Quick question–did you use raw wheat berries for these recipes, or we’re these recipes done using prepared wheat berries (i.e. soaking/cooking in water)?